In article 28 of the Youth Charter, the African Union Commission (AUC) within the AU is saddled with the responsibility of ensuring that state parties perform their obligations under the Youth Charter. In fulfilling this role, the AUC is mandated to invite states to include youths as part of its representation to the AU ordinary sessions; sensitise the youth population on the continent on its activities; foster collaboration among youth organisations on the continent; and partner with relevant civil society organisations in identifying best practices in youth policy formations. Through ‘persuasive and collaborative’ means, the AUC is mandated to foster the realisation of the obligations in the Youth Charter. But a relevant question which arises from a consideration of this provision is: aside from the AUC, can other regional institutions foster compliance with the obligations in the Youth Charter? The author is of the view that regional institutions that have special mandates under the AU Constitutive Act or other regional human rights treaties (such as the ACHPR) have significant oversight roles to perform although they are not specifically included in the Youth Charter. Within this space, the role of the African Commission on Human and Peoples’ Rights (African Commission) resonates. Article 30 of the ACHPR establishes the African Commission for the protection and promotion of human rights in Africa. Article 60 and 61 of the ACHPR permits and obligates the African Commission to take into account other international and regional human rights treaties. Specifically, Article 61 of the ACHPR mandates the African Commission to ‘take into consideration, as subsidiary measures to determine the principles of law, other general or special international conventions, laying down rules expressly recognized by member states of the Organization of African Unity’. Read with article 45 of the ACHPR (which provides for the function of the African Commission), the African Commission may formulate standards and consider individual communications relating to the protection of human rights in Africa falling within the purview of the Youth Charter. 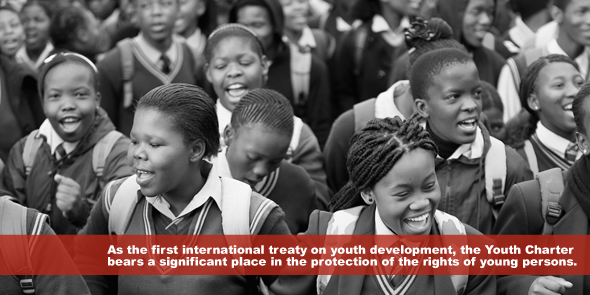 It is important to note that the Youth Charter itself has a Savings Clause which provides that ‘nothing in this Charter shall be taken as minimising higher standards and values contained in other relevant human rights instruments ratified by States concerned’ (article 29). If the Youth Charter is to become a beacon of African youth rising, specific regional institutions such as the African Commission, the Pan-African Parliament and the African Peace and Security Architecture must assist states to live up to the obligations contained in the Youth Charter through the exercise of oversight functions (at the regional level) over provisions of the Youth Charter falling within their specific mandates. With the exception of South Sudan, all African Union Member states have ratified the ACHPR. Although South Sudan signed the ACHPR on 24 January 2013, it is yet to ratify the ACHPR.